Once again the peace-loving citizens of the United Federation of Planets were called to battle tonight, and once again they went down to defeat, guns blazing, to the rapacious Klingon Empire. This time around both the Excalibur and the Encounter were destroyed, though not before the Encounter blew up one of the Klingon ships. This time around Jeremiah joined Sean , Steve and I in the melee, and it looks like he'll be building a fleet of his own. 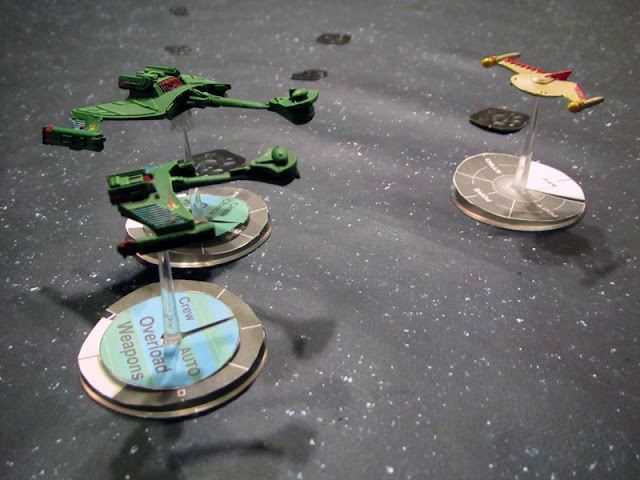 After the initial Federation vs. Klingon Empire skirmish, Sean and I each took command of a Romulan vessel to oppose Jeremiah and Steve's pair of Klingon intruders. For the first time we learned how the game's rules treat cloaking devices, and I put mine to good use, nearly destroying Jeremiah's ship. Unfortunately I blundered my opening move, leaving my ship too damaged to withstand Steve's vengeful retaliation. My ship went kaboom, leaving Sean to fend for himself. He very nearly managed to finish off Jeremiah's ship and even survived a withering assault from both Klingon crews. Thus far I've gone down to ignominious defeat four times in this game, but I'm learning something new each time. Maybe I'll survive a battle intact in our next encounter. Labels: Games, Jeremiah P., popular culture, Sean, Star Trek, StarFleet: A Call to Arms, Stephen F.